Humidity Indicator Cards are color changing indicators and are reversible per Military Specification Mil-I-8835. All the spots are blue in color when they are completely dry. As they get saturated with moisture the color changes from blue to lavender, to a pink color (Humid). 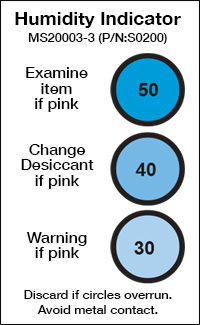 As the humidity level decreases the spots changes from pink to lavender, to a blue color (Dry). These cards are accurate to plus or minus 5% relative humidity at 75OF. Complies with Mil-I-8835 and Mil-P-116 Method Packaging. Military Standard MS20003-2 is approved by all governmental agencies, the Department of Defense and NATO for use in Method ll Packaging. This card is identical in design to the MS20003-2, except it is approximately 1/2 its size, making the MS20003-3 ideal where space may be a problem. This card complies with Mil-I-8835 and Mil-P-116 Method ll. It was developed for use with activated desiccant in packaging by the Atomic Energy Commission. 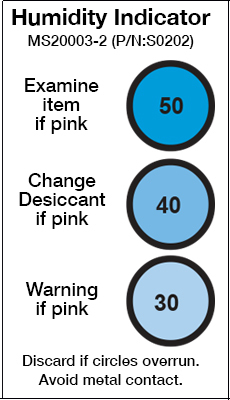 A warning arrow points to 30% RH, pink indicates a desiccant failure. Date of manufacture is imprinted on each card. *Please contact the factory for other Humidity Indicator Cards and Plugs available.